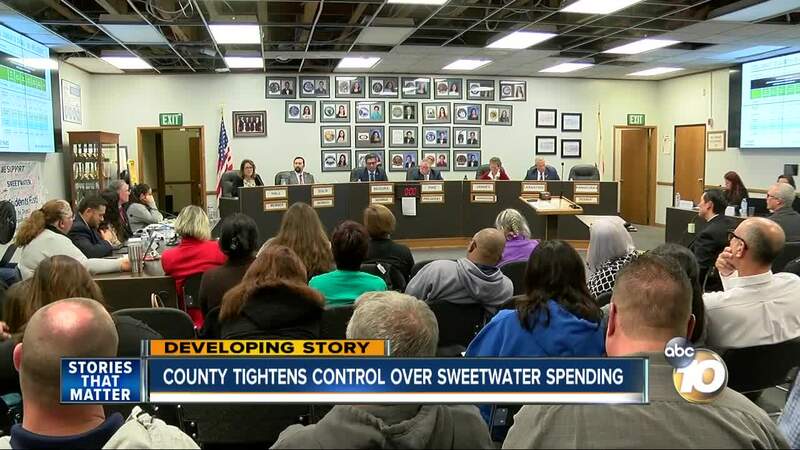 CHULA VISTA, Calif. (KGTV) - The San Diego County Office of Education appointed a fiscal advisor with power to stay and rescind any financial decision made by the troubled Sweetwater Union High School District, the SDCOE said Friday. The SDCOE named the advisor, Dr. Mark Skvarna, to serve as the “eyes and ears” of county education officials inside the district, SDCOD spokesperson Music Watson told 10News. Dr. Skvarna will exercise authority to control any action by the Sweetwater board that’s inconsistent with the district’s ability to meet its financial obligations, wrote SDCOE Assistant Superintendent of Business Services Michael Simonson. "What that means is that our fiscal advisor and the county superintendent of schools have authority to review board agenda items with a fiscal impact, comment on them and in extreme events rescind any action taken by the board that we believe is not in their best financial interest," said Simonson. SUHSD’s finances have been under the microscope since a $30 million dollar budget shortfall for the 2018-2019 school year was announced. District officials previously said the shortage was due to expenses from staff raises, including costs of substitute teachers and an unexpected $1 million expense for utilities. An independent audit showed SUHSD’s problems are worse than originally predicted due to factors including cash flow shortages, unsustainable salary, benefits, and pension increases, and declining local enrollment. This fiscal year alone, the district will borrow $93 million -- in addition to the $36 million they already owe. "Everyone's goal all along the way is that we are not impacting kids. This is an adult problem that we are trying to resolve to the best of all of our abilities the kids should not feel anything," Simonson said. "[In] light of the early retirement incentives, we want to make sure that they maximize the savings and that we have an individual in there to help them out and to help them make those decisions." In a letter sent from SUHSD trustees to the staff and community Thursday, trustees said SDCOE had asked the district to consider not accepting the Supplemental Early Retirement Plant approved for more than 300 staff members at a Dec. 17 special board meeting. "While we have a fundamental difference of opinion and approach with them, we will continue to ask them to be our partners in this effort as we move forward," the trustees wrote about the matter. "The financial situation we face was not created overnight, nor will it go away overnight, but you, as a community, have our deepest commitment that we will do everything we can possibly do to make this right," the letter said. 10News is working on this developing story. Please check back for updates.